First off, I’m one of them — a rescuer. I did volunteer work for a decade with the local parrot rescue group: fostering, behavioral rehabbing, doing parrot care classes (more complicated than you’d think), writing and maintaining the web site, spending a good hour a day on feeding, cleaning cages, etc. It was a major commitment. At times, I had up to eight of them here, awaiting adoption. Now, I’m down to four nearly unadoptable “hard cases” who had gone through many homes and many potential adopters before they decided they wanted to be here — and I wanted them. Why? The first one came to me after an alcoholic ex-girlfriend, who was an animal abuser (which I realized later), had a horrible auto crash. Her ex didn’t want the abused bird; her two kids in their early 20s didn’t want him; so he got me. I had to take him. My old cat had died a few weeks before, and I’d sworn I’d never have another animal. Really didn’t want one. But what was I going to do? He liked me, I liked him, no one else would take him, and he was a defenseless animal. So, a two-year-old abused Yellow Naped Amazon parrot acquired me. A year after that, I met a woman in a web design class who was doing volunteer work for the local parrot rescue group. I got sucked in: they saw I did well with abused Amazons, and I was shortly doing what I’ve described above, over the next decade fostering/rehabbing a good 30 or 40 birds. Along the way, three “hard case” Amazons acquired me — they were here long enough that I got attached to them, and they got attached to me, so here I am — with four permanent three year olds. But what are we supposed to do with parrots and other sentient creatures kept as pets? They should never have been put in that position. They should never have been kept as pets. It’s too cruel in itself. And some humans are simply beasts to animals (some of what I’ve seen is simply nauseating). But they’re here, so what do we do with them? The answer is obvious: stop breeding them as pets, provide the ones who are already here with kind homes. support captive breeding projects for endangered and threatened species, and do our best to protect and expand their remaining habitats. And above all, don’t buy birds. If you want one, adopt one from a rescue group or pet shelter. Parrot Sunday – Why Do Some People Misrtreat Animals? 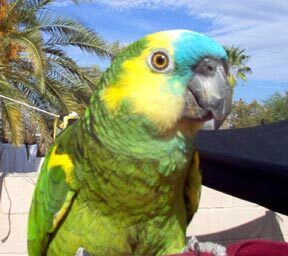 For a decade I did volunteer work with the local parrot rescue group (Tucson Avian Rescue and Adoption), mostly fostering birds waiting for new homes, and also rehabbing “problem” (biting, screaming, aggressive, or fearful) Amazons. Here’s a slightly pared down version of the slide show we used at our monthly parrot care classes for potential adopters. This slide show is in .odp (open document) format, so any common office suite should be able to open it. It’s also 43 megs, so it might take a while to download. If you already have a bird and would like to learn more about taking care of him or her, please give this slide show a look. And if you’re thinking about getting a bird, please take a look at this before you buy or adopt. Parrots are wonderful, but they’re very demanding, and there are many other good reasons not to get one.